Dernièrement, Apple a libéré l’iOS 6.1 bêta 3 mais nous ne connaissions pas les nouveautés et corrections de bugs. La firme a mis en ligne son Release Note répertoriant tous les changements à découvrir ci-dessous avec les appareils compatibles. Vous pouvez également profiter de cette version réservée aux développeurs sur ce lien. Vous noterez que l’iOS 6.1 bêta 3 n’apporte rien de nouveau mais simplement des améliorations et corrections de bugs. 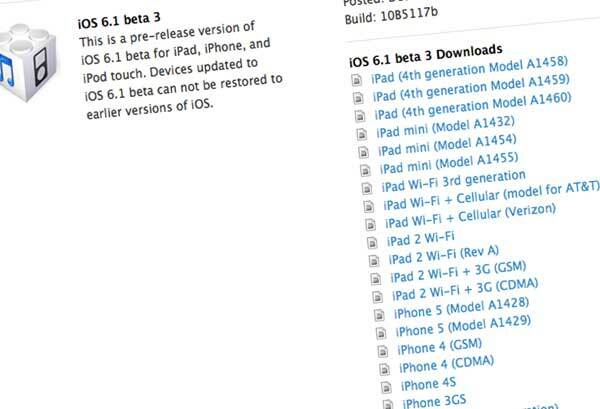 The following issues relate to using iOS SDK 6.1 beta 3 to develop code. FIXED: When browsing the iTunes Store, TV Shows is missing Networks, Genres, and Genius from the top menu. FIXED: The Top Movies and Top TV Shows grids are missing the featured carousels, as well as several featured shelves. FIXED: Podcasts is missing the Providers item from the top menu. TVs and receivers that support only IT video format no longer allow RGB High to be selected in Settings > Audio & Video > HDMI Output. If such a TV or receiver was set to RGB High before this update, another value will be used instead. FIXED: In iOS 6.1 beta 2, you will not be able to upgrade or downgrade your iCloud storage (5 GB is free). As a workaround, please use either the latest OS X or a device running iOS 6.0. FIXED: Typing quickly could result in incorrect input. FIXED: Some Emoji cannot be entered using the Pinyin and Zhuyin keyboards. FIXED: Zhuyin shortcuts containing words with first tone mark don’t work. FIXED: When using the Zhuyin keyboard, certain input sequences become impossible to type. FIXED: When using the Cangjie or Sucheng keyboard, the extended list often takes a long time to open. When using the iOS 6.1 SDK on OS X v10.8 (Mountain Lion), if you use the iOS 5.0 or iOS 5.1 “Legacy SDK” in iOS Simulator, you will not be able to sign in to Twitter via the Settings pane and Twitter.framework will not work correctly. If you need to test Twitter features, you will need to choose either the iOS 6.1 or iOS 6.0 Simulator run destination or test with iOS 5.x on a device. These problems do not occur when running Simulator on OS X v10.7 (Lion). NSString drawing additions and UILabel do not support NSTextAlignmentJustified or NSTextAlignmentNatural text alignments. Instead, use NSAttributedString drawing additions, which do support text alignments.